Start your new year with smoothie bowls to ground, energize and detoxify. Pow! My favorite smoothie ingredients, in this order. Re: these brands - these are the ones I use and love. There are definitely other great brands out there too, I just like to share what I use because inevitably everyone asks, and I do believe the companies work hard at creating amazing products. If you're looking for something in store, I recommend choosing products with an ingredient list you can understand, and to look for organic and fair trade/ RA certified when possible. 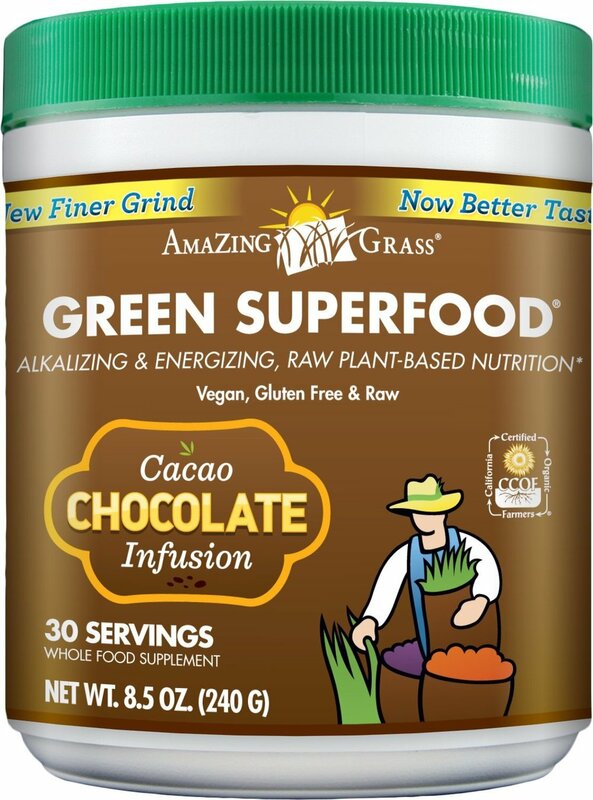 I love love love Amazing Grass Green Superfood. If I learned anything from going to NGI cooking school, it's that we can (almost) never get enough dark leafy greens in our diet. Dark leafy greens are the one thing I make sure I eat everyday - rich in vitamins, minerals, cancer-fighting properties, antioxidants, polyphenols - all of it. If you're not yet eating super greens daily, it's the one thing I'd recommend adding into your diet this year. I like this brand and flavor because most super greens taste grassy but the chocolate flavor here is much stronger than the green flavor, and tastes great. I prefer plant-based protein powder because it feels powerful enough to fuel me with a lot of energy, and it's significantly more sustainable for our planet than Whey Protein. I like Garden of Eden for plant-based protein because it has all the right ingredients, including probiotics that make a smoothie digestible. I also really like the flavor. Whey Protein is also great, particularly good if you're feeling like you need a mega protein boost. For me plant protein does the trick. See what works for you. I also enjoy this Grassfed Whey Protein. From the website: RAW Organic Protein is a Certified Organic, Non-GMO Project Verified RAW Vegan Protein powder made with 13 Raw sprouted proteins, 22 grams of protein that is dairy free and soy free, with a complete profile of all the essential amino acids, along with added whole food fat-soluble vitamins, probiotics and enzymes. My top 3 favorite smoothie add-ins are Cacao Nibs, Chia Seeds + Goji Berries. They add color, texture, flavor, and of course they add potent nutrition and energy for your day. Cacao Nibs are rich in antioxidants, magnesium, potassium. Cacao nibs give me energy and generally make me feel awake and happy - with moderate amounts of caffeine! Plus cacao stimulates the brain to release feel neurotransmitters that trigger the release of happy chemicals and endorphins. Rich in Omega 3 fatty acids, fiber, antioxidants and so much great golden nutrition, ground flax is great. It must be ground for body to absorb the nutrients, so make sure you get this version. Goji berries have been used in traditional Chinese medicine since BC times - for their ability to generate feelings of wellbeing, improve mood, and many systems in the body, including cardiovascular. I love Goji berries mostly for their chewy, raisin-like texture and their sweet/tart flavor. And of course their beautiful red color in smoothie bowls. Aside from being ancient medicine, they are also high in Vitamin A + C, selenium, iron and amino acids. . Enjoy this soothing winter breakfast as an easy, gourmet winter-time meal. Or share with friends and family as part of a beautiful, healthy (and easy!) breakfast or brunch. The quinoa is rich in protein but also easy to digest, and makes a perfect grounding breakfast. Option to soak quinoa overnight in water, which will sprout the quinoa, and reduce cook time to just 3-5 minutes the next morning. it’s a little extra work, and definitely not necessary, but it makes the quinoa even easier to digest. Serving size 2 - 3 portions. 1 1/2 cups coconut milk (shelf stable version or refrigerated, both work well) Almond milk + hazelnut milk are delicious alternatives too! Rinse quinoa in a strainer. Run water over quinoa until the water is clear and not cloudy. In a saucepan over high heat, combine the quinoa, 1 cup of the coconut milk, 1/2 cup water, and half of the vanilla bean seeds, and cinnamon. Bring to a boil, then reduce the heat to low, cover the pan and simmer until most of the liquid is absorbed and the quinoa is tender, about 12 minutes. Remove from the heat. Stir in optional 1 Tbsp maple syrup and the remaining 1/2 cup coconut milk. Or wait to add the coconut milk until you serve into each bowl. Top with fresh berries, banana, nuts or whatever your heart desires!